Barley Cottage in Horsford sleeps 2 people. 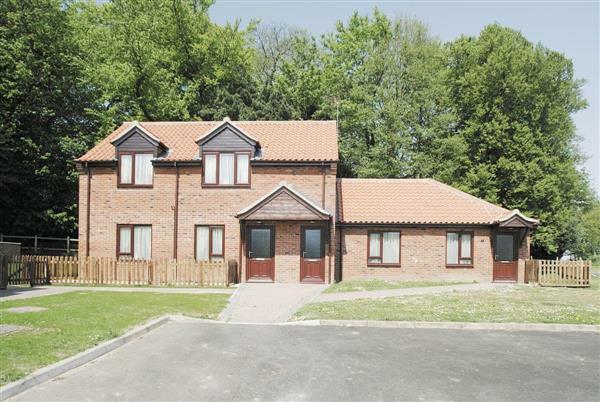 This purpose built first floor holiday apartment is set in 11 acres of comprising woodlands and countryside, and close by is the Marriotts Way with its 27 miles of cycle and footpaths. The cottage is well positioned for touring, with the Norfolk Broads and the unspoilt Norfolk Coast being within easy driving distance. Alternatively you could visit the fine city of Norwich with its superb facilities for all members of the family. Major attractions include the castle, cathedral, the Forum Museums and the excellent theatre. The city hosts one large shopping centre, along with its traditional stall market and narrow cobbled streets. North Norfolk has some impressive National Trust properties that are well worth a visit, Blickling Hall and Felbrigg Hall being two of the grandest. Shop 0.5 miles, pub with food 1 mile. This purpose built first floor holiday apartment offers the highest standard of accommodation. It is set in 11 acres comprising woodlands and countryside, and close by is the Marriotts Way with its 27 miles of cycle and footpaths. The cottage is well positioned for touring, with the Norfolk Broads and the unspoilt Norfolk Coast being within easy driving distance. Alternatively you could visit the fine city of Norwich with its superb facilities for all members of the family. Major attractions include the castle, cathedral, the Forum Museums and the excellent theatre. The city hosts one large shopping centre, along with its traditional stall market and narrow cobbled streets. North Norfolk has some impressive National Trust properties that are well worth a visit, Blickling Hall and Felbrigg Hall being two of the grandest. Shop 0.5 miles, pub with food 1 mile. All on first floor: Living/dining room/kitchen with wooden floor. 1 twin bedroom (can be double). Wet room with toilet. Gas central heating, electric, bed linen and towels included. DVD. Electric cooker. Microwave. Washing machine. Garden with patio. Built-in Barbeque. Parking (1 car). No smoking please. Holidays at Barley Cottage run from Friday to Friday. For a better idea of where Barley Cottage is, you can see Barley Cottage on the map below. Barley Cottage is in Norfolk; should you be on the lookout for a special offer, you can find all the special offers in Norfolk. It's always worth checking to see what is on offer at the moment. Do you want to holiday near Barley Cottage (W40837), you can see other cottages within 25 miles of Barley Cottage; have a look to find your perfect holiday location.